This tutorial is an interactive introduction to the SPARK programming language and its formal verification tools. You need not know any specific programming language (although going over the Introduction to Ada first may help) or have experience in formal verification. Run : compile the code with assertions enabled and run the executable produced. You can edit the sample code, so you can modify it and rerun the tools to see the effect of your changes on the compilation or analysis. Use the Reset button to restore the example to its initial version. a set of development and verification tools for that language. The SPARK language is based on a subset of the Ada language. Ada is particularly well suited to formal verification since it was designed for critical software development. SPARK builds on that foundation. Version 2012 of Ada introduced the use of aspects , which can be used for subprogram contracts, and version 2014 of SPARK added its own aspects to further aid static analysis. flow analysis is the fastest form of analysis. It checks initializations of variables and looks at data dependencies between inputs and outputs of subprograms. It can also find unused assignments and unmodified variables. proof checks for the absence of runtime errors as well as the conformance of the program with its specifications. The tool for formal verification of the SPARK language is called GNATprove . It checks for conformance with the SPARK subset and performs flow analysis and proof of the source code. Several other tools support the SPARK language, including both the GNAT compiler and the GPS integrated development environment. The SPARK Global aspect says that Increment does not read or write any global variables. The SPARK Depend aspect is especially interesting for security: it says that the value of the parameter X after the call depends only on the (previous) value of X.
Increment is only allowed to be called if the value of X prior to the call is less than Integer'Last. This ensures that the addition operation performed in the subprogram body doesn't overflow. Increment does indeed perform an increment of X: the value of X after a call is one greater than its value before the call. GNATprove can verify all of these contracts. In addition, it verifies that no error can be raised at runtime when executing Increment's body. 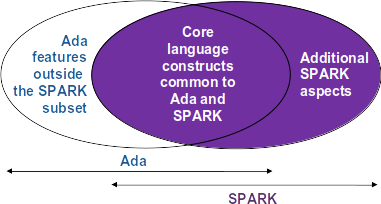 It's important to understand why there are differences between the SPARK and Ada languages. The aim when designing the SPARK subset of Ada was to create the largest possible subset of Ada that was still amenable to simple specification and sound verification. The most notable exclusions from Ada include exceptions and access types (including related features such as allocators), both of which are known to considerably increase the amount of user-written annotations required. Goto statements and controlled types are also not supported since they introduce non-trivial control flow. The two remaining restrictions relate to side-effects in expressions and aliasing of names, which we now cover in more detail. The SPARK language doesn't allow side-effects in expressions. In other words, evaluating a SPARK expression must not update any object. This limitation is necessary to avoid unpredictable behavior that depends on order of evaluation, parameter passing mechanisms, or compiler optimizations. The expression for G below is non-deterministic due to the order in which the two calls to F are evaluated. It's therefore not legal SPARK. The SPARK languages enforces the lack of side-effects in expressions by forbidding side-effects in functions, which include modifications to either parameters or global variables. As a consequence, SPARK forbids functions with out or in out parameters in addition to functions modifying a global variable. Function F below is illegal in SPARK, while Function Incr might be legal if it doesn't modify any global variables and function Incr_And_Log might be illegal if it modifies global variables to perform logging. function Incr (X : Integer) return Integer;         -- OK? function Incr_And_Log (X : Integer) return Integer; -- OK? In most cases, you can easily replace these functions by procedures with an out parameter that returns the computed value. When it has access to function bodies, GNATprove verifies that those functions are indeed free from side-effects. Here for example, the two functions Incr and Incr_And_Log have the same signature, but only Incr is legal in SPARK. Incr_And_Log isn't: it attempts to update the global variable Call_Count. It makes verification more difficult because it requires taking into account the fact that modifications to variables with different names may actually update the same object. Results may seem unexpected from a user point of view. The results of a subprogram call may depend on compiler-specific attributes, such as parameter passing mechanisms, when its parameters are aliased. Since access types (pointers in Ada) are not allowed in SPARK, aliasing can only occur as part of the parameter passing that occurs in a subprogram call. Functions have no side-effects in SPARK, so aliasing of parameters in function calls isn't problematic; we need only consider procedure calls. When a procedure is called, SPARK verifies that no out or in out parameter is aliased with either another parameter of the procedure or a global variable modified in the procedure's body. This procedure itself is valid SPARK. When doing verification, GNATprove assumes, like the programmer did, that there's no aliasing between Total and Source. To ensure this assumption is valid, GNATprove checks for possible aliasing on every call to Move_To_Total. Its final call in procedure No_Aliasing violates this assumption, which produces both a message from GNATprove and a runtime error (an assertion violation corresponding to the expected change in Total from calling Move_To_Total). Note that the postcondition of Move_To_Total is not violated on this second call since integer parameters are passed by copy and the postcondition is checked before the copy-back from the formal parameters to the actual arguments. Since the SPARK language is restricted to only allow easily specifiable and verifiable constructs, there are times when you can't or don't want to abide by these limitations over your entire code base. Therefore, the SPARK tools only check conformance to the SPARK subset on code which you identify as being in SPARK. You do this by using an aspect named SPARK_Mode. If you don't explicitly specify otherwise, SPARK_Mode is Off , meaning you can use the complete set of Ada features in that code and that it should not be analyzed by GNATprove. You can change this default either selectively (on some units or subprograms or packages inside units) or globally (using a configuration pragma, which is what we're doing in this tutorial). To allow simple reuse of existing Ada libraries, entities declared in imported units with no explicit SPARK_Mode can still be used from SPARK code. The tool only checks for SPARK conformance on the declaration of those entities which are actually used within the SPARK code. The package P only defines entities whose specifications are in the SPARK subset. However, it wants to use all Ada features in its body. Therefore the body should not be analyzed and has its SPARK_Mode aspect set to Off . You can specify SPARK_Mode in a fine-grained manner on a per-unit basis. An Ada package has four different components: the visible and private parts of its specification and the declarative and statement parts of its body. You can specify SPARK_Mode as being either On or Off on any of those parts. Likewise, a subprogram has two parts: its specification and its body. A general rule in SPARK is that once SPARK_Mode has been set to Off , it can never be switched On again in the same part of a package or subprogram. This prevents setting SPARK_Mode to On for subunits of a unit with SPARK_Mode Off and switching back to SPARK_Mode On for a part of a given unit where it was set fo Off in a previous part. Here's a package defining an abstract stack type (defined as a private type in SPARK) of Element objects along with some subprograms providing the usual functionalities of stacks. It's marked as being in the SPARK subset. Side-effects in expressions are not allowed in SPARK. Therefore, Pop is not allowed to modify its parameter S.
Let's turn to an abstract state machine version of a stack, where the unit provides a single instance of a stack. The content of the stack (global variables Content and Top) is not directly visible to clients. In this stripped-down version, only the function Pop is available to clients. The package spec and body are marked as being in the SPARK subset. As above, functions should be free from side-effects. Here, Pop updates the global variable Top, which is not allowed in SPARK. We now consider two procedures: Permute and Swap. Permute applies a circular permutation to the value of its three parameters. Swap then uses Permute to swap the value of X and Y. Here, the values for parameters Y and Z are aliased in the call to Permute, which is not allowed in SPARK. In fact, in this particular case, this is even a violation of Ada rules so the same error is issued by the Ada compiler. In this example, we see the reason why aliasing is not allowed in SPARK: since Y and Z are Positive, they are passed by copy and the result of the call to Permute depends on the order in which they're copied back after the call. Here, the Swap procedure is used to swap the value of the two record components of R.
This code is correct. The call to Swap is safe: two different components of the same record can't refer to the same object. Here's a slight modification of the previous example using an array instead of a record: Swap_Indexes calls Swap on values stored in the array A.
GNATprove detects a possible case of aliasing. Unlike the previous example, it has no way of knowing that the two elements A (I) and A (J) are actually distinct when we call Swap. GNATprove issues a check message here instead of an error, giving you the possibility of justifying the message after review (meaning that you've verified manually that this can't, in fact, occur). We now consider a package declaring a type Dictionary, an array containing a word per letter. The procedure Store allows us to insert a word at the correct index in a dictionary. This code is not correct: access types are not part of the SPARK subset. In this case, they are very useful because without them we can't store arbitrarily long strings in an array. One solution here is to use SPARK_Mode to separate parts of the access type from the rest of the code in a fine grained manner. Here's a new version of the previous example, which we've modified to hide the access type inside the private part of package P, using pragma SPARK_Mode (Off) at the start of the private part. Since the access type is defined and used inside of a part of the code ignored by GNATprove, this code is correct. Let's put together the new spec for package P with the body of P seen previously. The body of Store doesn't actually use any construct that's not in the SPARK subset, but we nevertheless can't set SPARK_Mode to On for P's body because it has visibility to P's private part, which is not in SPARK, even if we don't use it. Next, we moved the declaration and the body of the procedure Store to another package named Q. And now everything is fine: we've managed to retain the use of the access type while having most of our code in the SPARK subset so GNATprove is able to analyze it. Our final example is a package with two functions to search for the value 0 inside an array A. The first raises an exception if 0 isn't found in A while the other simply returns 0 in that case. This code is perfectly correct, despite the use of exception handling, because we've carefully isolated this non-SPARK feature in a function body marked with a SPARK_Mode of Off so it's ignored by GNATprove. However, GNATprove tries to show that Not_Found is never raised in Search_Zero_P, producing a message about a possible exception being raised. Looking at Search_Zero_N, it's indeed likely that an exception is meant to be raised in some cases, which means you need to verify that Not_Found is only raised when appropriate using other methods such as peer review or testing.